Awe might seem like just another three-letter word, but it is so much more. A recent New York Times article detailed how humans can get goose bumps when we experience awe, that often-positive feeling of being in the presence of something vast that transcends our understanding of the world. It is a catalyst that can motivate people to do more good. The article also highlighted the research of Paul Piff and Dacher Keltner who found that awe helps bind us to others, motivating us to act in collaborative ways that enable strong groups and cohesive communities. Think back to the last time you experienced awe and think about how this impacted you. I would wager that many specific experiences come to mind, which is not very surprising at all. Descriptors such as awesome, jaw dropping, satisfying, and rapturous probably come to mind. The power of awe cannot be overstated. It is a huge component of life—it’s hardwired in our brains. When we experience the sensation of awe, we are consumed by wonder, relevancy, emotion, engagement, inspiration, and real-world connections. Jason Silva considers awe to be a pivotal ingredient in making ideas resonate. Check out his Shots of Awe YouTube series and you will see exactly what I am talking about. Below is the one video of his that got me hooked. Excuse the pun, but you will be “awed” while watching it. "Participants "who felt awe, relative to other emotions, felt they had more time available, were less impatient, were more willing to volunteer their time to help others, and more strongly preferred experiences over material goods." Awe is an experience of such perceptual expansion that you need new mental maps to deal with its incomprehensibility." Applying this concept to education is both exciting and depressing. Awe is a driving force for learning that will not just benefit our students now, but also well into their future. However, traditional views and functions of school deprive many students from experiencing the joy and power of awe as a catalyst for meaningful learning. Current policies in many (not all) schools focus on control, compliance, conformity, and rules that don’t awe our learners. Data from a recent Gallop Poll shared and analyzed by Dr. Scott McLeod shows what many of us know - students are disengaged, bored, and disempowered. Systemic change is needed even in schools where there are isolated pockets of excellence, as all students should be exposed to the power of awe. "Don't prepare kids for something. Prepare them for anything." We have a responsibility to awe and students need us to bring this element into their daily learning experiences, such as those aligned to Quad D of the Rigor Relevance Framework. To do this we must innovate our practice. 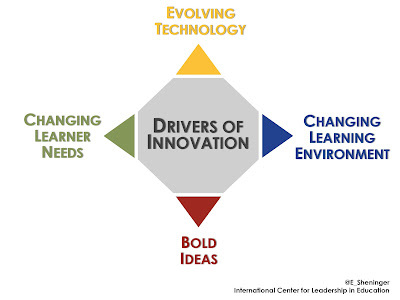 In my definition innovation is creating, implementing, and sustaining transformative ideas that instill awe to improve learning. Increases in our willingness to innovate can result in disruptive changes to learning. Disruption in a way that facilitates improved learning opportunities that engage and empower students through awe should be the goal. 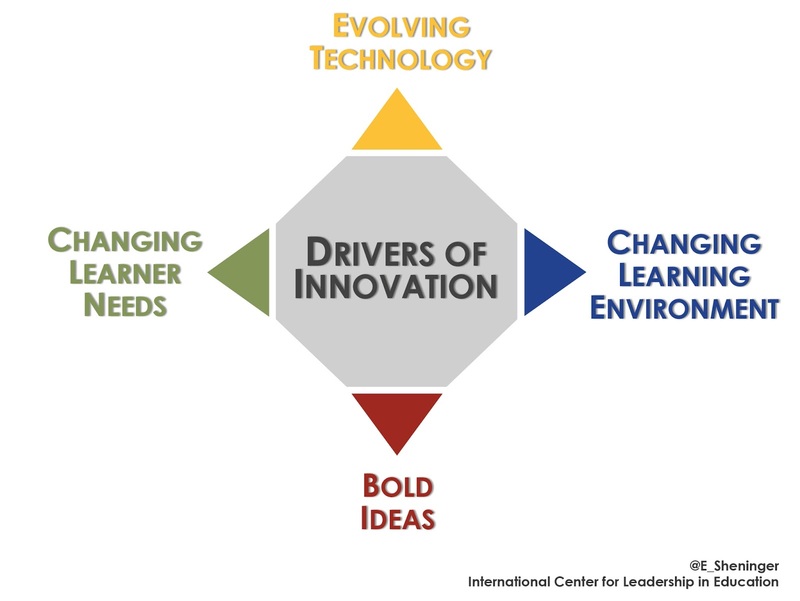 In order to drive innovation there has to be a focus on changing learner needs, evolving technologies, changing the learning environment, and bold ideas. Evolving Technologies – Technology continues to change at a rapid pace, which presents education with some exciting opportunities to awe learners. Some examples include augmented reality, virtual reality, open education resources (OER), adaptive tools, coding, drones/robotics, and gamification. With all the excitement and possibilities it is important to remember that pedagogy trumps technology if the goal is meaningful student learning. 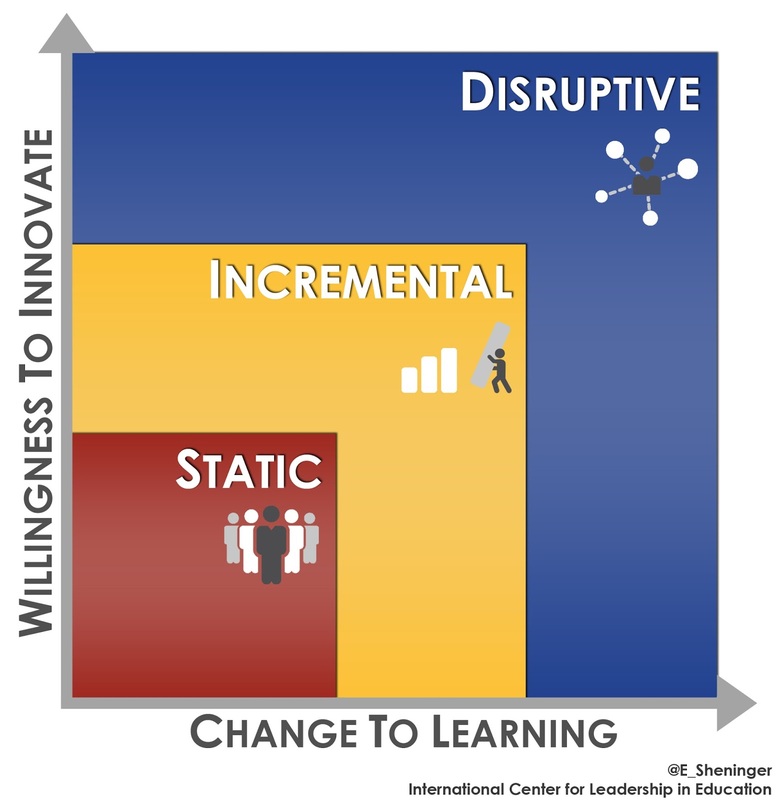 Changing Learning Environment – You can have all the best technology and digital pedagogical techniques, but if the learning environment remains unchanged the results that we yearn for might never materialize. Learner designed spaces emphasize comfort, flexibility, choice, and the use of authentic tools. They are reflective of the real world, leverage the outdoors, and capitalize on mobile technology. Changing Learner Needs – Learners crave a greater purpose and sense of relevance in their learning. We must seize on the gift that access to the real-time web provides to foster student learning anytime, anywhere, and with anyone. Awe can be cultivated in both personal and personalized learning opportunities where the main motivation comes from student agency. This all culminates in a shift from consumption to creation and curating as a means for students to awe us in their learning experiences. Bold Ideas – There needs to be a shift from business as usual to business as unusual. Ideas that are bold work to counteract the status quo and current education reform policies. We must work to elevate the profession, integrate more play in the school day, embrace failure throughout the system, redefine success and learning, and provide meaningful professional learning with accountability. To inspire students we must make a concerted effort to bring the awe back into learning. This is not an easy journey, but one that is well worth the potential hardship. Awe leads to greater engagement. Thanks for this encouragement Eric. Breaking them out of their stimulus comfort zone is difficult (not impossible), however what I feel we need to also consider, is breaking teachers out of theirs.